Do you have a few friends who would like to join in starting a new league team? It is a very simple process. Each league requires a minimum number of players to get a team in the league. View the league calendar for your area to see what the minimum number is for each league. If you plan to play out of a site that currently offers leagues, simply contact the facility coordinator and ask for a team number. Once you have the team number, you and your teammates can register on TennisLink. If you do not know who the facility coordinator is, contact the league department. If you plan to use a new location for your team, please contact the league department to let us know that you are starting a new team in a new location. There are a few simple steps that will need to happen prior to getting your new team involved when it is a new location. Each location involved in leagues must have a current USTA Organizational Membership. 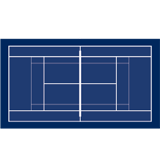 Find out if the site you plan to use has an organizational membership and if it is current with the USTA. • Each location must have a person recognized by USTA Colorado as the Facility Coordinator. This person is the primary contact person for USTA Colorado and is responsible for reserving courts, appointing captains, communicating important league information to captains, and ensuring that the league experience for all players at your location is a pleasant and organized one. • The USTA Colorado League Department communicates important information to all facility coordinators in an annual meeting. Attendance is mandatory. If meetings have all passed, a time to meet with you individually can be scheduled (new facility coordinators only). • The USTA Colorado League Department will provide you with team numbers for the teams you plan to host at your new location. • Once you have the team number, you and your teammates can register on TennisLink.